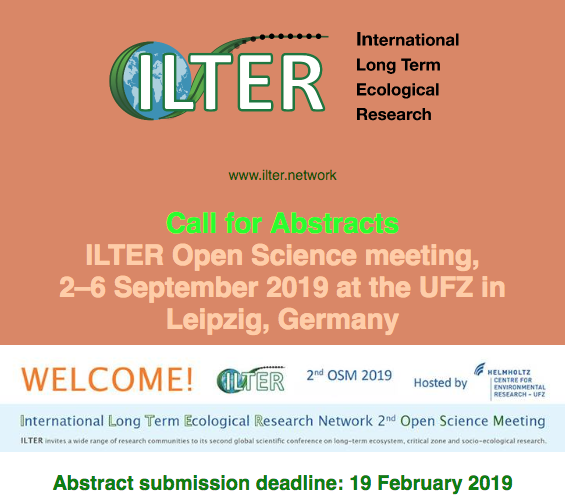 Welcome to ILTER 2nd OSM 2019 – the International Long Term Ecological Research Network 2nd Open Science Meeting to be held 2–6 September 2019 at the UFZ in Leipzig, Germany. WHY? Inspired by the experiences and feed-back from the first ILTER Open Science Meeting 2016 in Kruger NP, South Africa, ILTER decided to organize an OSM every 3 years to foster scientific exchange and community building within and beyond the ILTER networks around the globe. The Program Committee cordially invites you to submit an abstract for an oral presentation or for a poster presentation. To submit an abstract (max. 3,200 characters incl. blanks) it is necessary to create a user account. Deadline for abstract submission is 19th February 2019. Please note: Registration and abstract submission are two different procedures. The submission of an abstract does not register you automatically as an attendee! You must also register as a conference participant but you can use your abstract submission account (user name and password) for this step. Early bird registration is possible until 27th May 2019. Please do not hesitate to contact ilter2019(at)fu-confirm.de for any further request.